Berlin, 7th October 2015: The PoC-ID Project brings together 13 proven academic and corporate expert teams from 7 European countries to address the increasing demand for rapid and sensitive point-of-care diagnostics, to reduce healthcare costs, increase quality of life, and improve the treatment with a focus on infectious diseases, one of the world’s leading causes of morbidity and hospitalisation. 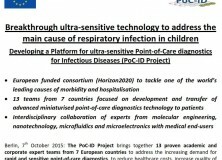 A prototype user-friendly point of care (PoC) platform will be developed to target unmet needs for early and fast detection of viral respiratory infections, using the paradigm of respiratory syncytial infection (RSV), a major cause of disease burden in children but also a major diagnostics and management challenge in the daily practice. RSV is the leading cause of acute lower respiratory infections (ALRI) in children, estimated to cause approximately 33.8 million new episodes of ALRI in children annually. Annual RSV-related deaths have been estimated at 253.000, mainly in developing countries, and account for up to 6.7% of the mortality of children aged <1 year globally, positioning RSV as the second most important cause of death during infancy. In addition, to severe acute disease, RSV infection has been linked to an increased risk in the development of childhood wheezing and asthma in later life. Any advance in RSV detection, clinical characterisation and cost reduction for diagnosis and treatment will have a major impact on the healthcare system. 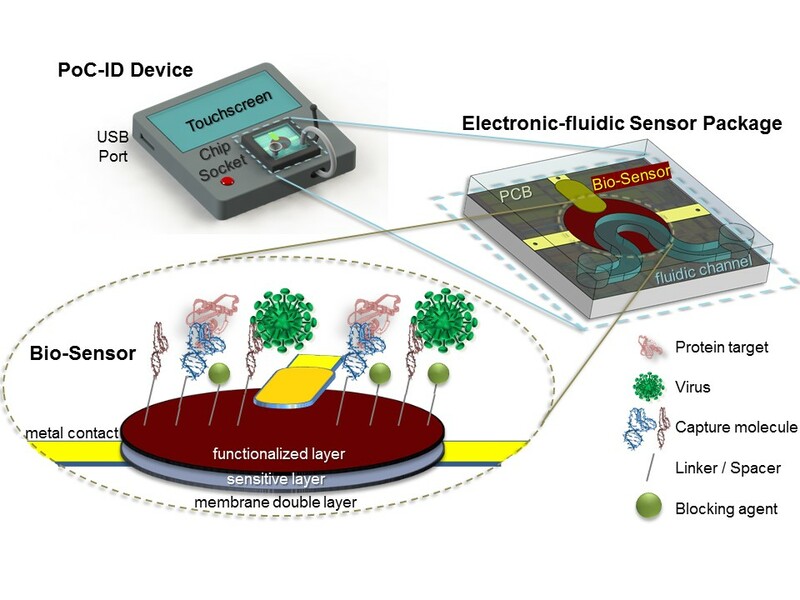 The PoC-ID device will combine the detection of both host and pathogen biomarkers in the same sample, leading to a rapid, cheap and accurate diagnosis and prognosis, providing almost real-time results. By multi-parameter analysis of infectious agents and host biomarkers, the sensors will support the medical decision for the selection of the best treatment strategy: hospitalisation or send home; empirical antibiotic treatment, supportive care or wait and see. The PoC-ID platform may also be used for monitoring disease progression and may guide the assessment of new therapeutic and prophylactic drugs under development for RSV infection. Improved performance in terms of robustness, sensitivity and selectivity will be reached by a combination of innovative RNA oligonucleotide-based capture molecules (aptamers) that are generated by molecular engineering ‑ and two novel ultra-sensitive sensing concepts: a biologically active graphene field effect transistor (BioGrFET) and a sensor-based on microelectromechanical system (BioMEMS) technology. Novel carbon nanomembranes will be used as a functionalisation interposer to simplify the binding procedure of the capture molecules onto the biosensor surface. Bringing graphene and nanomembranes into application will have strong synergetic effects with current nanotechnology development. Further advances will be realised in terms of usability and speed of data-analysis arising from the integration of sensors, read-out electronics and microfluidics into one user friendly point-of-care (PoC) platform. Costs of the new disposable sensors will be ultra-low at high volumes, thanks to designing into microelectronics production flows. All components developed in the project will be designed as multi-purpose modules; this will create a new PoC platform technology adaptable to a diversity of diagnostic needs. The addressed point of care diagnostics market is a large segment in the total in vitro diagnostic market and accounts for approximately $11B per year, with an annual growth of 19%. The PoC market is an important complementary driving force for the transition to personalised medicine, which is gaining considerable traction as all stakeholders regularly re-evaluate the optimal way to provide healthcare cost-effectively. The innovative platform technologies developed in this project will support the strong trend to personal healthcare, consumer home-use of medical electronics, and bedside testing & monitoring with the objectives of cost reduction and improvement in quality of life. PoC-ID is a Research and Innovation Project funded by the European Union within the Horizon 2020 programme. Grant Agreement: 634415. This Press Release reflects only the author’s view and the European Commission is not responsible for any use that may be made of the information it contains.